Despite the intense heat that saw temperatures soaring close to the 110 degree mark in the late afternoon, Pete Hernandez remained cool as a cucumber as the NASCAR diversity driver romped to his second Havoline Western Late Model feature win of the season at Stockton 99 Speedway on Saturday. After missing the setup in qualifying and a zero invert, Hernandez was forced to start the 10-car, 50-lap feature from the sixth position. It didn’t phase him as he quickly worked his way up to second before simply blowing by 20-year–old college student #15, Mark Holeman, of Los Gatos, for the lead on lap 30. "We were a little bit off in qualifying, but we made a few changes and it really paid off," said the exuberant Hernandez, who hails from Chicago, Illinois and now resides in Sacramento. "It felt really good in hot lapping. I can tell when a car is right and I thought ‘the game is on now.’ We were on fire tonight." Finishing almost a full straight away behind Hernandez, Holeman was able to hold off season points leader #61, Guy Guibor of Manteca for second. Defending track champion #5, Pete Anderson Jr., of Stockton, trailed them across the finish line for fourth and Stockton’s #90, Ron Strmiska Jr. rounded out the top five. It was a gallant effort by #90, Strmiska, who backed his car into the concrete wall in practice and bent the frame. The crew hastily packed the car up to make a quick trip back to the shop for repairs only to experience a flat tire on the hauler along the way. The extra effort paid off as Strmiska and crew were able to get the car back to the track before the main, although he was forced to start from the rear after missing qualifying. "They say I hit some oil so I will go with that since it sounds a lot better than just me messing up," laughed Strmiska. "I was hoping to make it back for qualifying to get a better start, but it all worked out." Starting from the seventh position, Escalon’s #28, Darrell Hughes fought his way to the front of the 21-car American Limited Stock Car field by lap 12 of the 30-lap feature and then hung on for dear life to capture his first ever career win in the ultra-competitive class. Hughes was hounded relentlessly by Lodi’s #31, Jeff Ahl for the final 13 laps of the race, but despite the intense pressure, he was able to repulse all of Ahl’s challenges. "We worked hard for this. I owe it all to my dad," said Hughes, while clutching his first place trophy on the front straight. "I was really worried about Jeff at the end. He showed me a fender a couple of times, but I was able to hold him off. I have a lot of respect for him. He ran me clean." Normally kissing your sister is a bittersweet experience at best, but Ripon’s Mike Regelman was all smiles as he accepted a peck on the cheek and the winner’s hardware from his younger sister Tiffany, the evening’s trophy girl, following the Grand American Modified (GAM) feature. Regelman started the 50-lap feature from the pole, but quickly fell behind several drivers in the early going of the race. He was eventually able to work his way back to the front, finally passing Modesto’s #15, Mike Beeler on lap 28 to take the lead. After taking the top spot, Regelman was not going to be denied as he then pulled away from the field to earn his second win of the season and career. Defending GAM champion #5, Jason Philpot, of Sacramento, finished second and Beeler hung on for third. "We had some bad luck at the beginning of the year, but all of our hard work is paying off," said the sweat drenched Regelman. "This sure feels good and it is sinking in right away too. The first one took a couple of days." While it was a night that Regelman will long remember, it was a night for Grand American Modified season points leader Jay Linstroth, of Citrus Heights, would like to forget. Linstroth crashed his car hard into the turn 2 wall after an arm in the front end cracked during pre race practice. His friend Jeff Stephens, of Sacramento, came to his rescue and loaned Linstroth his car for the GAM main. "I am only looking at the positive this year," said Linstroth before the race. "Luckily, the car broke in practice and not the race, my good buddy let me have his car and I didn’t get hurt. It could have been much worse." Unfortunately, it did get worse for Linstroth in the main. After starting the race from fourth, Linstroth was forced to the pits on lap 5 with water spewing from the engine. Although he was able to make repairs and return to the back of the pack without losing a lap, thanks to a caution, he was soon back in the pits for good after he was tapped by Stockton’s Fred Rathjen and walloped the front straight wall. Woodland’s Gary Koster passed Michael Zarevich, of Manteca, on lap 9 to take the lead and ultimately the checkered flag in the 20-lap NCMA Sprint feature, which ran caution free. Zarevich was able to hang on to second while Rob Hammond, of Morgan Hill, completed the podium. Despite a small field of only six cars, the Baby Grands staged an entertaining 20-lap feature as Tracy drivers Mike Conti and Jake Smith traded off the top spot in an exciting back-and-forth battle throughout the second half of the race. It was Conti who made the decisive, final pass two laps from the end to take a hard earned win over Smith and third place finisher Dominic Portera of Morgan Hill. Manteca’s #16, Jacob Gomes, age 13, easily outdistanced Lincoln’s Jarrett Kelly and his younger brother #18, Joshua, along with the rest of the 14-car field to post another convincing win in the 20-lap Young Guns main. Jacob Gomes has now won 12 straight events at Stockton and an amazing 24 of the last 25 in the division overall dating back through last season. 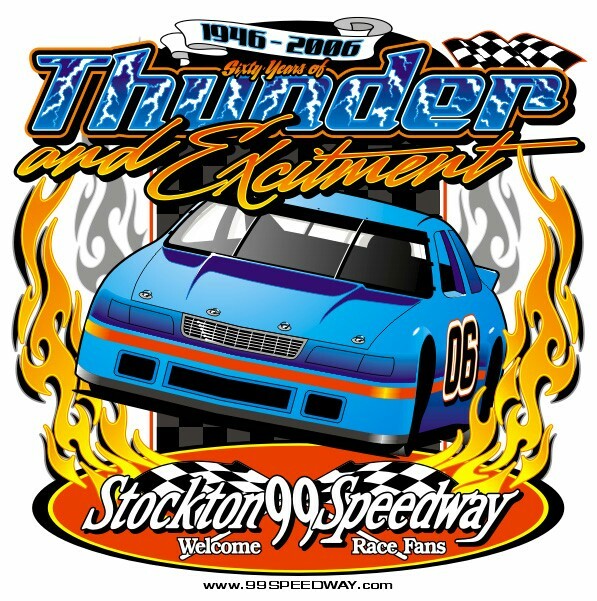 The Stockton 99 Speedway will return to action next Saturday night, July 29, with a five division "double points" program that includes the NASCAR Dodge Weekly Racing Series Western Late Models, Grand American Modifieds, American Limited Stock Cars, Pro-4 Trucks, presented by Havoline/C.L. Bryant, plus the Legends. For Stockton 99 Speedway information call the 99 Race Line at (209) 466-9999 or go to www.stockton99speedway.com on the web.